If you know anything about me, you’ll know that one of my passions is musical theatre. Ask any one of my friends and they’ll back me up. I am genuinely obsessed with performing. Ever since my first production almost four years ago, I’ve kept up a pretty consistent rehearsal schedule. There’s never been a gap of more than a year between my shows. I plan a lot of my activities around whether or not I can continue to do musical theatre alongside them. I’m always either coming down off the rush of one show or preparing for auditions for the next. My catchphrase has l become “I can’t, I have rehearsal.” But despite how in love I am with being onstage, I actually almost quit musical theatre after my most recent production. This the story I’m going to tell, and we’re going to start at the very, very beginning, back when I first started acting. In 2014, I decided to audition for my community theatre company’s production of A Seussified Christmas Carol (which, by the way, was exactly what it says on the tin) and break into the theatre world. I had been in love with the idea of acting since I first started going to plays with my Girl Scout troop back in elementary school. |Everyone onstage seemed to be having the time of their lives and unlike in T.V. and movies, the audience was right there cheering the actors on. The idea of acting was intimidating, especially considering the fact that I’d never performed before but I still went for the audition and A Seussified Christmas Carol was everything I’d ever dreamed. Our cast of eight quickly became a family. I found a space where I was completely and utterly myself and I had an amazing time making the audience laugh. It was the most thrilling experience of my life. I decided that from that moment on, I was an actor. Almost four years later, I was rehearsing for another Dr. Seuss-based production, Seussical but I was far from the girl who’d auditioned for A Seussified Christmas Carol. The girl who decided that she was going to keep performing forever and ever and ever. in fact, I was starting to wonder if I really belonged in theatre at all. See, the four plays between A Seussified Christmas Carol and Seussical were all been amazing experiences but they’d also showed me the darker side of theatre. They showed me how scary auditions can be and how going in unprepared will always come back to bite me. They showed me how hard it is to combine singing, dancing, and acting and that it’s even harder to combine them and make that mixture beautiful. They showed me that by performing I was putting myself in a very vulnerable position and that sometimes what my director tells me isn’t going to jive with what I feel is right. And ultimately I have to follow their directions. They showed me that sometimes it’s hard to leave things at the door and not let my life affect my acting in a negative way. Some of those lessons I learned the hard way, through various awkward and slightly mortifying experiences that I would’ve rather forgotten. By the time we started rehearsals for Seussical, my view of theatre had changed. No longer did I see theatre as a place where I was completely myself, where the toughest scenes were fun, and where my cast members and I were making something beautiful. Instead, my mind was wrapped up in singing louder, getting the choreography perfect, scrutinizing my own every move so that I wouldn’t throw off the people on stage with me, and trying (while failing) to hide all of my emotions for the sake of “looking professional.” Instead of enjoying theatre, I had turned it into yet another source of anxiety. So as soon as we went on break, I got out of the room as fast as I could and went to sit in the stairwell until I calmed down. But as I was trying to convince myself that the harmonies really weren’t that big of a deal and that I could go home and work on them, I started thinking about something else; if I was this anxious over something so minor, maybe I should quit theatre. This response gave me a lot to think about when I went home that night. Was it possible that maybe I’d reacted prematurely and maybe I still belonged in theatre after all? Was it possible that the monsters in my head were lying to me? As we wrapped Seussical, another friend mentioned something to me that I’d completely ignored. Suddenly, I had an answer to the question I’d been asking since I started Seussical. 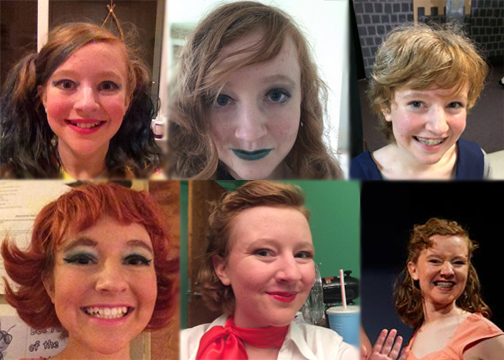 I don’t know how it happened, but somewhere between my first show and my most recent one, I lost sight of why I’d joined theatre. I became so consumed with anxiety and trying to be perfect that I completely forgot how much performing had made me smile. The purpose of musical theatre is to tell a story, to make the audience feel something, to make people happy, to make them laugh and to want to sing and dance with you. Part of the magic of performing with a live audience is how human the story becomes. Because of all the nasty inner voices in my head, I’d forgotten what I was doing on the stage. The truth is that I am on the stage to feel the rush of adrenaline as we finish a number and the audience applaud. I’m there to find myself falling into a character. The big thing I took away from this experience is that you can’t let your fears and anxieties keep you from doing something you love. I nearly quit musical theatre, one of the places where I’ve felt the safest, because my anxiety was telling me that I no longer belonged there, even though my gut instinct was to stay and find the spark I’d lost. So the only thing I can tell you if you’re facing a decision like this, is to go with what your gut is telling you. You may find that you still have something to learn and something to gain and that you haven’t lost your love for it after all.